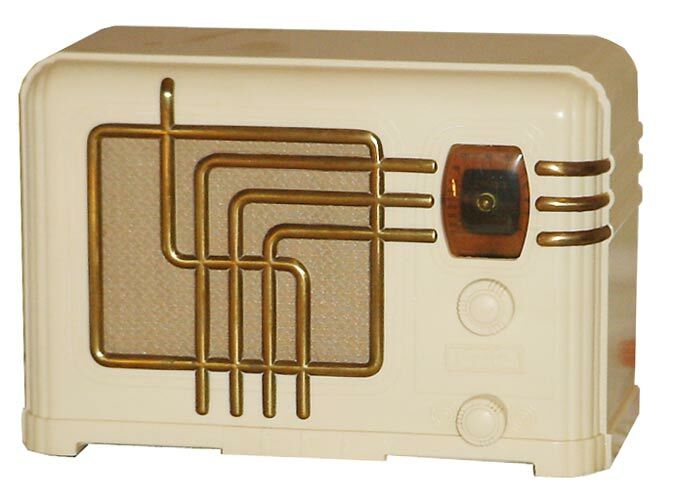 This beautiful art deco ivory plaskon Fada 260G is adorned with attractive gold accent trim around the speaker grille. The 260G is one of the "Coloradio" 260 series offered by Fada in four different cabinet colors and with optional metal accent trim for the 1936 year. Other related models include the 260W (Walnut Bakelite, no trim), 260B (Black, no trim), 260D (Black, chrome trim), 260BG (Black, gold trim), 260R (Chinese Red, no trim), 260RG (Chinese Red, gold trim), 260V (Ivory Plaskon, no trim). The black bakelite was originally priced at $19.99 or $24.95 with the chrome trim. The ivory plaskon with or without the gold trim was $24.95. The Chinese Red variant is the rarest of them all. The cabinet design was reused for several years in other models including those with 3 knobs, different speaker grille design, and also for the Dictograph "Silent Radio" models. 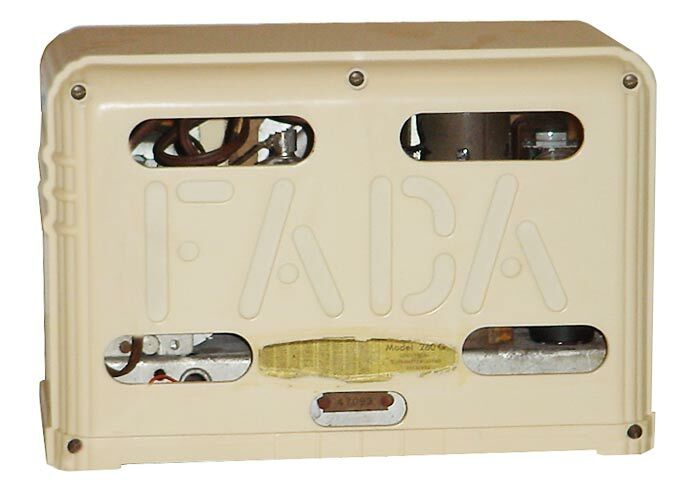 The 260 series also came with nice molded cabinet back covers with FADA letters in the mold.